Dublin put back-to-back All-Ireland titles for the first time in their history by finally beating Cork in a Croke Park decider. The Dubs had suffered endless heartache at the hands of the Rebels, the game’s dominant force for the previous decade, over the years. So this will have been particularly sweet for the Girls in Blue, who left this game dangling over the fire for longer than they would have liked in front of a record attendance of 50,141. Mick Bohan’s two in-a-row champions are clearly the best team in women’s football and it looks in the coming year as though they will develop an intense rivalry with Cork, who have moved rapidly through a transitional phase and are more than ready to challenge. Ultimately, the difference on the day was the class Dublin had up front. Cork were almost totally reliant on the free-taking of Orla Finn, who noted 0-08 from the dead ball, with only three other players getting on the score sheet. Dubs captain Sinéad Aherne was their main scoring threat, but she had plenty of assistance, particularly from the direct-tuning Carla Rowe who scored a goal in either half. Their direct lines and fast hand saw them work several second half openings down the middle. They went for goal more often than not and none of them have come off so their lead remained around the two-point mark. Rowe made the decisive intervention after 48 minutes of play though, crashing home her shot for Dublin’s third goal following on from a great run from Lyndsey Davey. Dublin were good value for their four-point half-time lead, though with the first period 30 minutes old they were only one ahead. Rowe finished a great team move to the back of the net, with Noelle Healy and Olwen Carey both making important contributions. She had options outside her but had the confidence to bury the ball past keeper Martin O’Brien. The Rebels responded well with captain Ciara O’Sullivan’s first score of the day, though Niamh McEvoy got the last point of the half after the Girls in Blue cleverly played out the countdown clock to ensure they had the last play. Dublin got their first goal 18 minutes in when Davey was double-teamed in the square and captain Aherne stepped up to sweep home the penalty, leaving the keeper standing. Early on the Dubs were able to frustrate Cork’s attack by getting women back in defence and putting up a blue wall. Their tackling was crisp, they stripped the ball and attacked in numbers. A feature of their play was the speed they moved the ball through the hands and it helped set up a series of attacks as they hurt the Rebels on the break. They also put O’Brien’s restarts under pressure and it was from such a turnover that Aherne got the second point of the day when she really should have raised the green flag from close range and team mates either side of her screaming for the pass. But Cork kept at it and they started to find a way through, initially through three frees from Finn, who got three before the break. They got themselves back level at 1-04 apiece when Áine O’Sullivan lobbed Dublin keeper Ciara Trant in confusing circumstances. 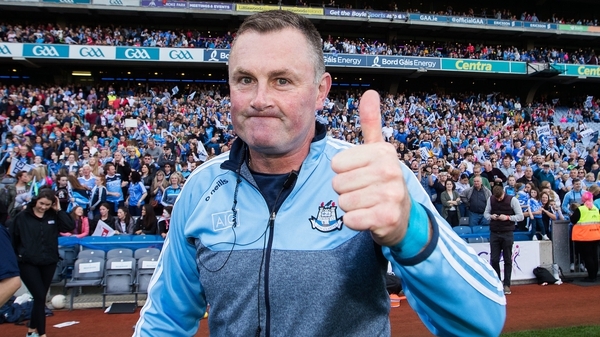 From the stands it appeared as though referee Garryowen McMahon had signalled an advantage to the Dubs after the ball was stripped as they came out of defence. The play continued to unfold, with O’Sullivan applying the finish. The players in blue jerseys had a few words with the match official after he awarded the goal, but there wasn’t going to be any changing his mind. Cork manager Eiphie Fitzgerald made his first change at the break, bringing on young scoring sensation Saoirse Noonan for Libby Coppinger, who had been part of the Rebel team that won the All-Ireland camogie title seven days previously. She saw precious little possession though and didn’t even muster a shot on target. Dublin, kicking into he Canal End after the change of ends, kept their noses in front throughout the second half and when Rowe got her second goal the countdown to victory was on. 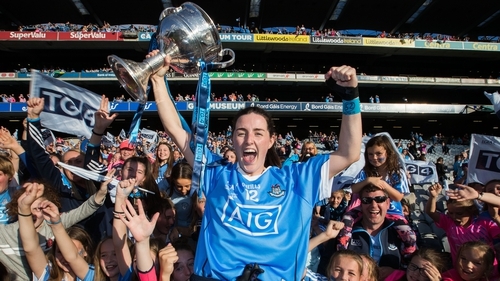 Dublin: Ciara Trant; Niamh Collins, Leah Caffrey, Martha Byrne, Sinéad Goldrick (0-01), Sinéad Finnegan, Siobhán McGrath; Lauren Magee, Olwen Carey; Lyndsey Davey, Niamh McEvoy (0-01), Carla Rowe (2-00); Sinéad Aherne (1-07, 1-00 pen 0-04f), Noelle Healy, Nicole Owens (0-02).